Tonight, I witnessed one of the best deals around at The Drafting Room in Exton, PA. If you do nothing else during Philly Beer Week (and you live or work somewhere in the Chester County area), as was the case with the friend I was sitting with at the bar, this should probably be the one event. After all, you do need to have dinner, right? Here's the deal. Get an appetizer, get an entree, and get two 10-ounce beers. Not just from a list of a few beers....ANY two beers. That's right. Tonight it could be the Sierra Nevada Chico, it could be the Bear Republic Apex, or it could have been Founders Imperial Stout. Yeah. And, pay only $21.99. uh, oh yeah. From what I witnessed, these portions were regular sized portions and the beers were for real. 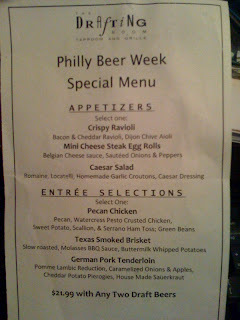 This can't be much of a money-maker for The Drafting Room, so got get yourself one of these economic deals of the week and celebrate Philly Beer Week in Exton.